caption The test of Netzelia tuberculata shows its mulberry surface which gave the name (tuberculata). As all Lesquereusiidae Netzelia builds up the test with self-made siliceous pads (called idiosomes). 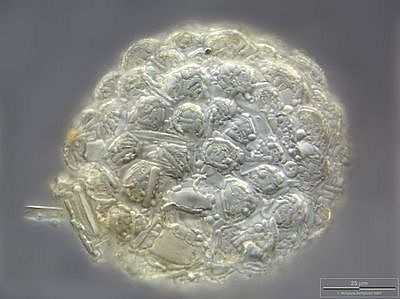 A few xenosomes are also visible. All xenosomes are covered with a siliceous coating. Scale bar indicates 25 µm. Sample from a freshwater pond on the island of Hiddensee (Baltic Sea, Germany). This image was taken using Zeiss Universal with Olympus C7070 CCD camera.